The Air Pogo® is best described as a pogo on a rope. It lets kids take a big bounce in the air instead of on the pavement. Just suspend it from a tree limb, deck, wooden swing set or any other 8 1/2 ft. sturdy overhead support with 6 ft. obstacle clearance. 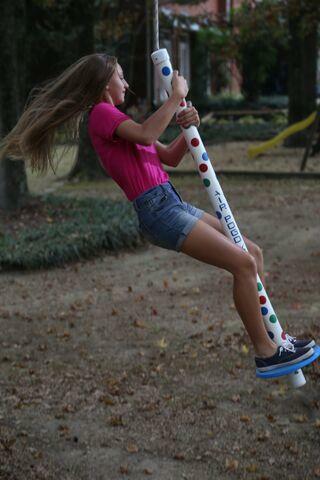 Provides endless fun - allowing kids to swing and bounce up to 2 1/2 ft. without touching the ground. Made in the USA. Weight limit: 200 lb. Recommended ages 5 and up. Dimensions: L: 12" x W: 12" x H: 62"